About 2 weeks ago I bought a set of floormats at Costco for my Accord. 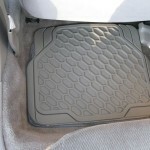 I had been looking and searching for a good set of floormats but had not been able to find anything. Every set I looked was thin rubber, or a good set with durable thick rubber was $40 or more. Even the sets I would bought for $40 had odd designs. It seemed for keeping dirt on the mat they would have been inadequate. Also lots of floormats have carpeting. Why do you need carpeting on a floormat? Doesn't make sense to me. I checked Sears, Target, Wal-Mart, auto parts stores…everywhere! 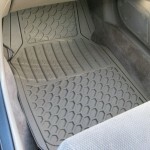 All had floormats that would have worked, but not thick ones like I wanted for a reasonable price. Costco's set of floormats are great! Thick, durable, and the brown-tan color blends in well with my Honda's interior. I expect to get a great use out of these mats especially with the bad and wet weather in Baltimore recently. It was $15 for the set of 4 FloorMats, 2 for the front and 2 for the back. If you want or need a set of floormats, I would recommend these from Costco. They have been great for keeping my Honda's carpeting from grime and dirt. They will prove to be a good invest for a long time. 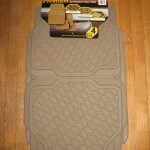 Going into the cold winter months, floormats are something that would be a wise item to get for your car. Since a lot of people want to get more mileage out of their cars in this economy. 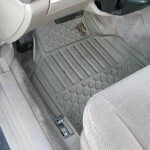 Obviously floormats won't help your car run better, but will keep it looking fresh and cleaner for longer. Notice I like to leave as much rubber material on the mats as possible, even for my small 96 Honda Accord. That way they catch as much dirt and grime as possible, the whole point of the floormats.